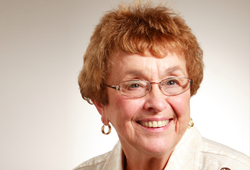 Rita Schobert came to know about the Community Foundation along with her late husband, Rudy, when Rudy was ill and their attorney began talking to them about estate planning. Rita established several funds with the Community Foundation that will help her meet her charitable dreams. She said it was important for her to leave a legacy and to thank the community, where she has lived for nearly 40 years, for how good the community has been to her. Rita graduated from Stephens College with an Associates in Arts degree, married Rudy and raised three daughters. After her children were grown, Rita worked at Ramsey News Company in their Accounts Receivable Department. Rita volunteered with Salvation Army, Tri-Kappa, the Billy Sunday Museum, the Warsaw Evangelical Presbyterian Church, and as a board member for the Kosciusko County Community Foundation. To future generations, Rita says, "Invest your time, your talent and your treasure in worthwhile activities. Don't spend to glorify yourself, but help others in need." Rita and her husband, Carl, reside in Winona Lake.